One of our favorite color combinations, Pink and Yellow. 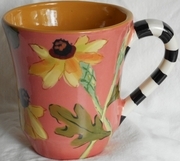 Enjoy drinking out of our Flower Patch Mug/Black Eyed Susan- 4 -1/2"tall x 4"wide. Click on photo to enlarge.